Tecentriq (atezolizumab; Roche/Chugai) is an antibody designed to target programmed death-ligand 1 (PD-L1) on tumor cells, allowing the body’s immune system to recognize and properly respond to the tumor. Tecentriq (atezolizumab; Roche/Chugai) is a fully humanized monoclonal antibody that targets programmed death-ligand 1 (PD-L1). PD-L1 is expressed on the surface of antigen-presenting cells and some tumor cells. PD-L1 binds to programmed death-1 (PD-1) co-inhibitory receptors which are expressed on the surface of T cells after T-cell activation. The receptor ligand interaction produces inhibitory signals which regulate T-cell activation and promote immune tolerance, which favors tumor progression. By blocking the PD-L1/PD-1 interaction, Tecentriq enables T-cell activation and allows the immune system to mount a more effective anti-tumor response. Tecentriq (atezolizumab; Roche/Chugai) is being positioned as a first-line therapy in combination with Avastin (bevacizumab; Genentech/Roche/Chugai) for the treatment of patients with advanced or metastatic renal cell carcinoma (RCC). Competition among therapies targeting the programmed death-1 (PD-1) receptor and its ligand (PD-L1) is expected to be intense with four therapies expected to be available for use in the lucrative first-line setting by the end of the forecast period. 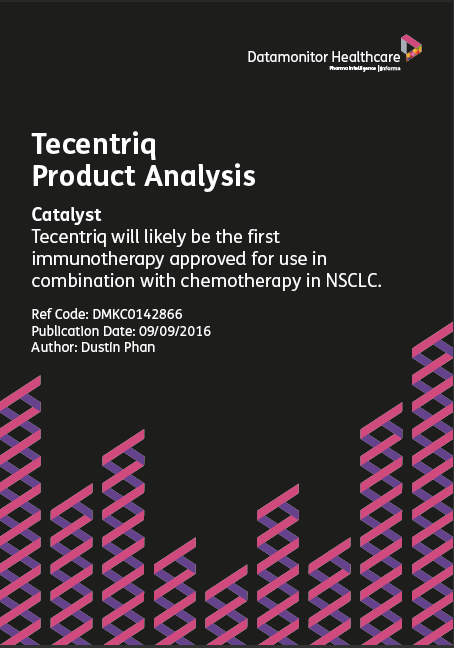 In addition to its development for the first-line setting, Tecentriq is expected to be the first PD-1/PD-L1 therapy approved for the adjuvant setting. Following this, competition in this setting is expected from other PD-1/PD-L1 therapies Keytruda (pembrolizumab; Merck & Co) and Opdivo (nivolumab; Bristol-Myers Squibb/Ono Pharmaceutical) + Yervoy (ipilimumab; Bristol-Myers Squibb). Bavencio (avelumab; Merck KGaA/Pfizer) is not yet being investigated for use in the adjuvant setting.